October Botanical tapestry shows the lavish flowers of mid autumn, from the work of British botanist Robert Furber. The variety of flowers in this series of works, for each month of the year, from the original called Twelve Months of Flowers from 1730, is truly remarkable. In this work, he cataloged and identified hundreds of species of blooming flowers, plants and seeds. The colors and details of each bloom is detailed as a botanical study, as well as a work of art. The leaves and flowers are also seen to fall onto the ornate stone ledge below. Each flower type is named in the glossary below the work, as is the emblem labeled as October. 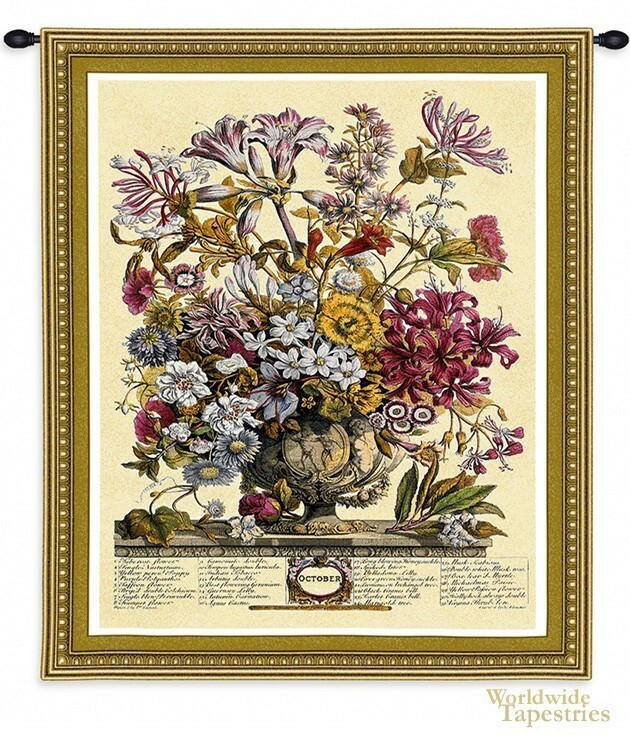 October Botanical tapestry has a lining and a rod tunnel for easy hanging. Note: tapestry rod and tassels, where pictured, are not included in the price.